After large eruption 2010, now ( Since 15 sept 2011 )magmatic activity of volcano Merapi has been Normal.The magmatic activity can rise to higher level anytime.Some changes along climbing trail have been occurred due to huge explosive eruption impacts. 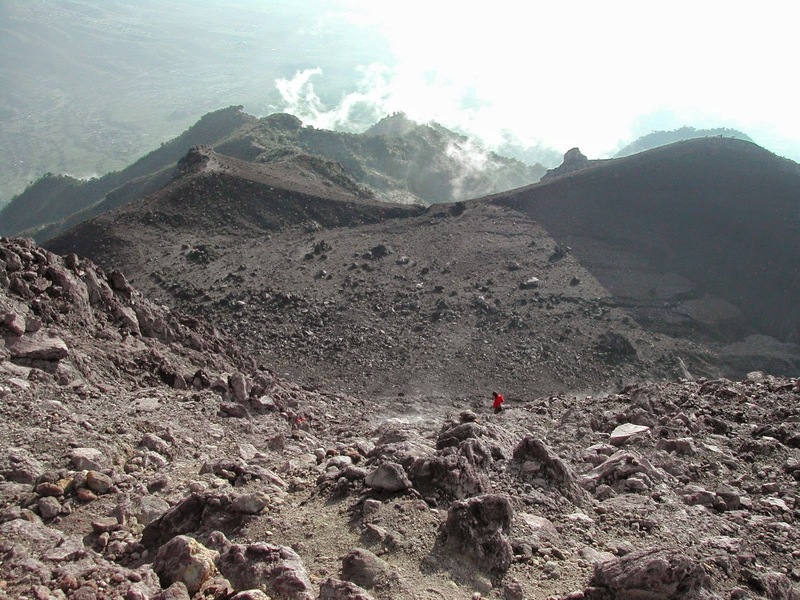 Mostly half of climbing trail along section Pasar Bubrah up summit were dominated by volcanic sand.Past popular summit locally called GARUDA collapsed already due to impact of huge explosive eruption. Today most visited zone is the crater rim where the sensational view of the crater is well visible. Extra energy, and gears required to tackle the route.This Merapi trekking trip suits for those have tight time,and have good fitness level for more enjoyment and experiences.Less night sleep make this full day hike physically get more difficult. Pick up at hotel you stay around city of Yogyakarta at night 08:30 pm, trip briefing,check list and transfer heads for hiking basecamp of Merapi at Selo.Check with trekking permit deal,intro you to Merapi,then take rest to allow you more time to adapt to this new rising altitude. Actual drive 2,5 hours. Take rest and have a glass of warm tea plus light meal with the locals at basecamp. At midnight,final preparation & briefing then commence the hike through village, farmland ecosystem, secondary forest, and volcanic stone plus 3 boulders up Pasar Bubrah. Arrive Pasar Bubrah approx 04:00 am, take longer break at Pasar Bubrah before tackling the hardest section of the hiking route heads for new crater rim approx 2900 m. Have relaxing break, enjoy warm tea/chocolate/cereal plus bread on cool dark early morning at Pasar Bubra then proceed the hike with by crossing the sandy section, as well as through the volcanic boulder plus fumarol field up the crater rim of the volcano. Be extra careful, and more focus on trail. We arrive on new crater rim of Merapi in early morning, and you have the chance to take the sensational view of the crater of this most active Indonesian volcano, and fantastic views surrounding.After sight seeing on, we then descend back at 06:30 am heads for Pasar Bubrah,then proceed the descend heads for New Selo 1750 m to transfer you return to Yogyakarta city. Arrive Yogyakarta city 12:30 pm. Drive 2,5 hours.Breakfast en trekking route at breaking point on volcano.Normal Actual Hike 7,5 hours ascent-descent.Alt Hiking Gain/Lose = 1350m/1150 m.
Feel free & comfortable to contact through available contact form for newest cost per person,notify us you small group size (pax 2-4) and departure date demand. 4)Trekking & Local Guide services. 8)Trekking Permit and local donation. 9) Use of necessary safety gears. 3.Accommodation before & after trekking trip.